This luxury Ocean Front villa estate is made of 2 separate villas 4 BR and 7 BR, or combine for 11 Bedrooms. LITTLE BUNGADESA Villa 4-bedroom presents a single-storey family pavilion with two bedrooms and a shared bathroom, and a double-storey pavilion with two bedrooms, each with private bathrooms, semi-open-air living and dining room with an integrated kitchen and private swimming pools. BUNGADESA Villa 7-bedroom presents one family suite with two bedrooms and a shared bathroom, plus five more bedrooms each with a private bathroom, as well as a semi-open-air living with a TV/DVD player and dining room with an integrated kitchen and aprivate swimming pools. The BUNGADESA ESTATE comprising two self-contained villas, one with 7 bedrooms and the other with 4 bedrooms total 11-bedroom Looking out over green treetops and the sea, each villa has its own private entrance, in 3400m2 garden, and 2 private swimming pools. The two villas are linked by a door in the garden wall, and can be rented separately or together. 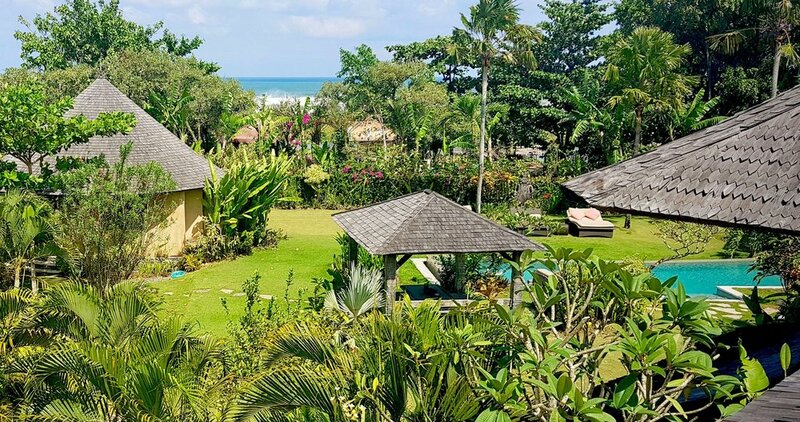 The property is strategically located in the South of Canggu, on the outskirts of fashionable Seminyak with its internationally acclaimed restaurants such as Metis and Sardine. Trendy beach clubs like Finn's and the WW Bar are 10 minutes walking distance via the beach. If you are a yoga fan, Desa Seni is about 600 metres away. Nearby is La Laguna, a quirky, cool restaurant, bar and lounge from where you will be able to access the beach via the wooden bridge that stretches over the lagoon to the beach. Please be informed that La Laguna helds events occasionally, hence music can be heard from inside the villa.